I’d forgive you for thinking that I ran this picture through Photoshop. But it’s exactly what I saw. Every photo in my website is–I’ve never modified a picture, and I never will. 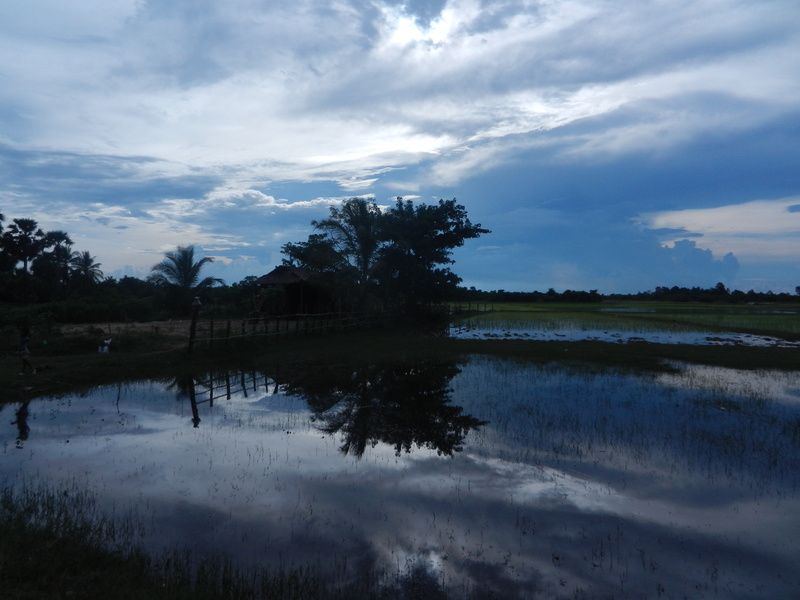 My recent visit to Cambodia was during the rainy season, and it was more of a visual feast than I expected. 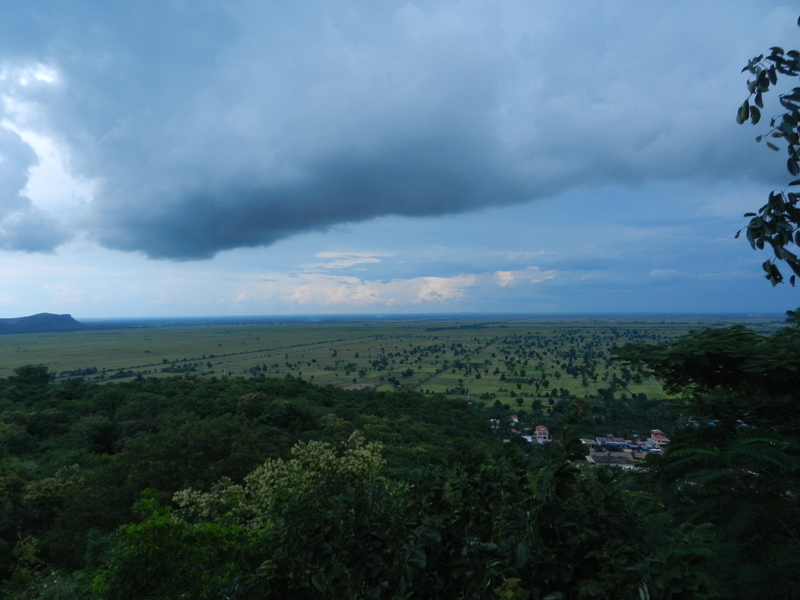 The views were so stunning that the ancient Khmers would have had no doubt that divine forces were bringing them. A person hasn’t really been to Cambodia unless he was there during the monsoon. 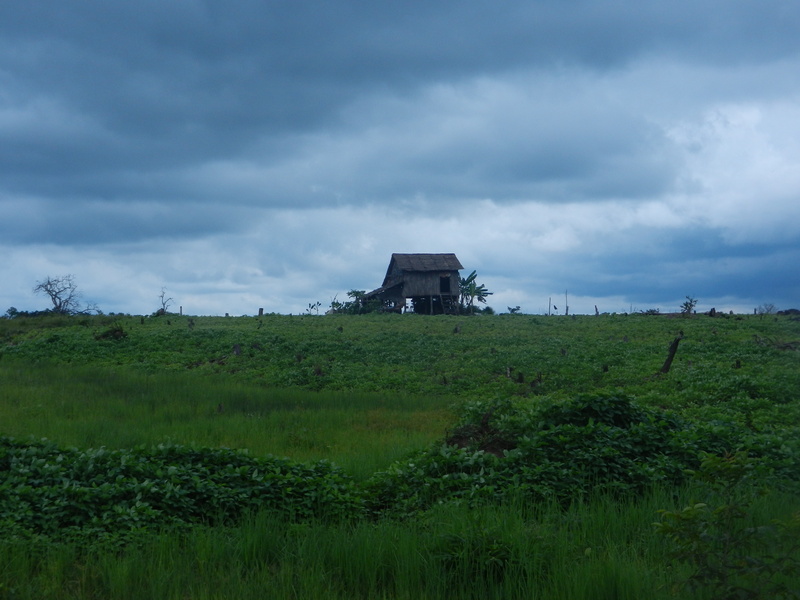 The landscape was luminous, and appreciating it is crucial for understanding the thought behind Angkor Wat and the other great Khmer temples. I’ll take you there in this post. 1. 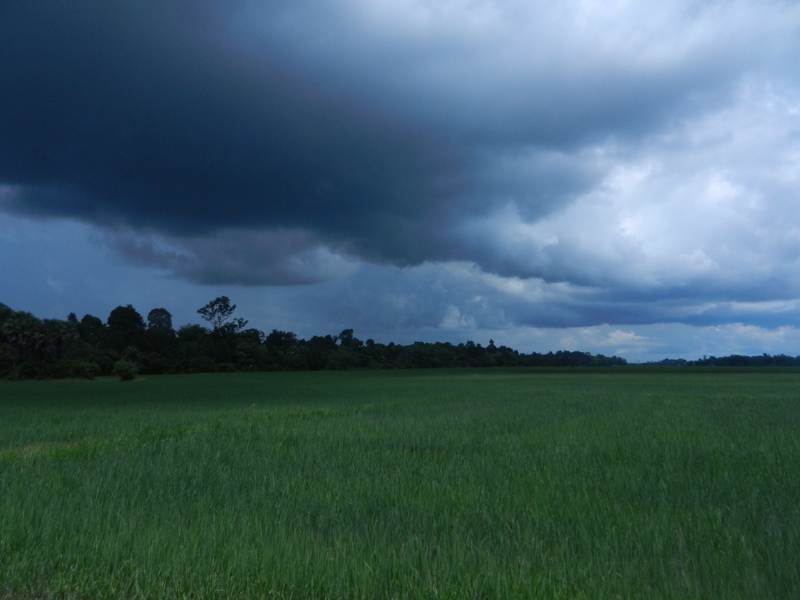 Contrasts between sky and land that are so dramatic that only the gods can create them. The billowing clouds stand out from the flat rice fields as dramatically as the great temples did, and still do, from farmers’ homes. 2. Reflections between sky, land and water that are beautiful beyond words. Before the monsoons come in May/June, Cambodia’s weather scorches, and its land is a dry reddish brown. But now the views take on new dimensions that are dramatic enough to seem divine. Everything seems reflected in everything else. Praise the glorious gods and king! And the reflections shift with every meter you walk. They seem alive. Cambodians know how to enjoy this beauty. These girls in the countryside south of Phnom Penh were doing what their Khmer ancestors did: having fun under a pavilion by the water. 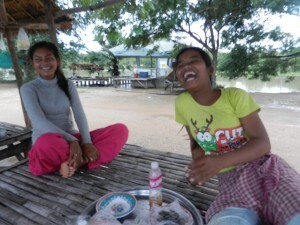 Even though I found plenty of poverty in Cambodia, its people were quick to enjoy the moment whenever possible. When times are good, they’re very good. Praise the glorious gods and king! 3. 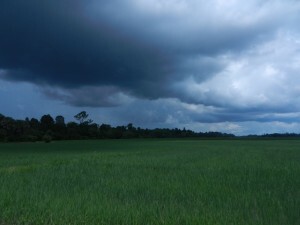 The rain usually isn’t constant–it comes and goes. And it comes suddenly. I had to rush down the stairway shortly after I took the first picture in this post to avoid a drenching. I got soaked many other times–including the hour before I took the last picture. Maybe the girls were laughing at me. The sky isn’t just a mechanical weather system–it’s alive. It’s infused with spirits. You can’t second guess them–you have to be humble under their constant presence. 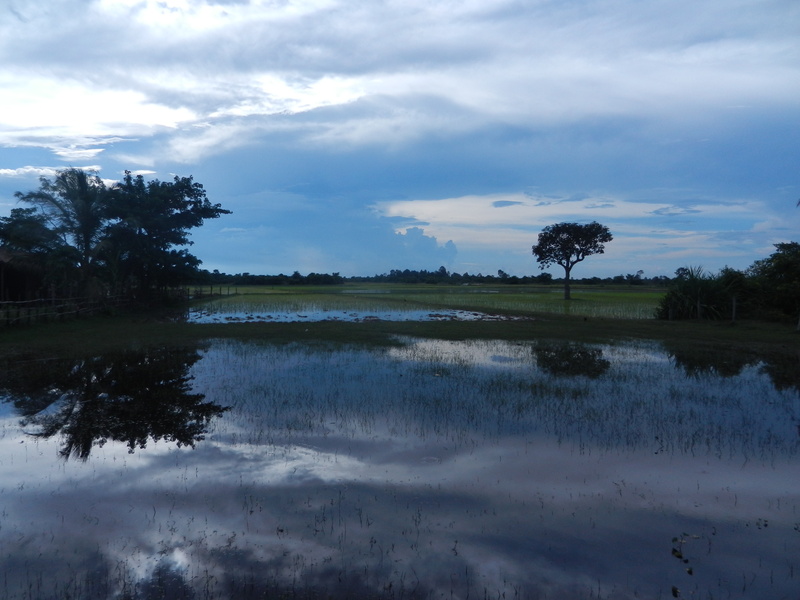 These majestic monsoons usually came every year when the Khmers began to build their empire in the 9th century–when kings built the first temples like Preah Ko, which set intellectual and artistic standards that inspired Angkor for the next 600 years. I can attest that they still inspire.